Editor’s note: This article originally appeared in the Winter 2016/Bluegrass Beyond issue of No Depression in print. When we’re not running a summer subscription drive (now through June 15), stories from the journal are exclusive to print. 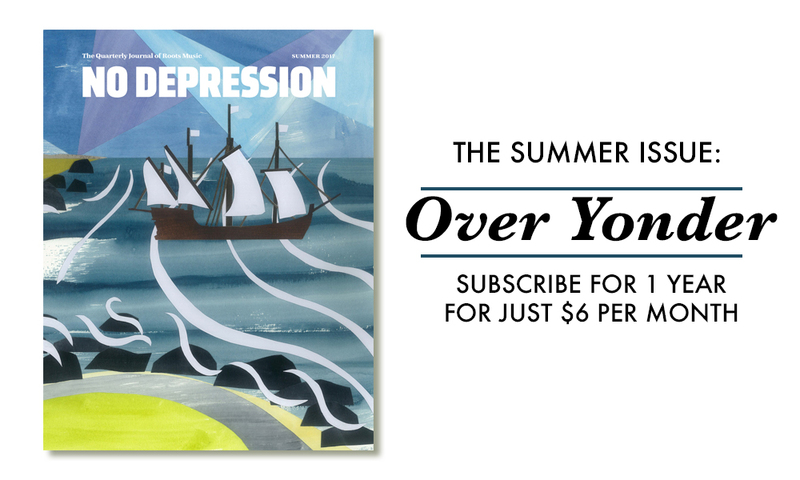 Subscribe today for just $6 per month and never miss another issue. At the International Bluegrass Music Association’s awards show this year, I watched from the wings as Sierra Hull and Becky Buller accepted awards for Mandolin Player of the Year and Fiddle Player of the Year. They became the first women in the 27-year history of the IBMA Awards to win their respective instrumental categories, joining a tiny sisterhood of only three of us whom had ever won that distinction. So it was a momentous but bittersweet evening in that regard – at once a celebration of how far women have come in bluegrass and a reminder of how far we “distaff” pickers have yet to go. I grew up in the ’70s and cut my musical teeth playing bluegrass in Southern California. It was the heyday of Gloria Steinem’s feminist movement and, despite the fact that there weren’t very many female musicians around, it never occurred to me that girls shouldn’t play banjo – just that they didn’t. From my earliest teenage years, I almost always played exclusively with guys (there simply were no girls to play with) and, more often than not, they would offer me their best compliment (and not a backhanded one in its day): that I sure did pick good for a girl. True, I was an oddity. But rather than talk about that I thought it best to try to lead by example, believing that if I was really good the musical opportunities would follow. And in the most important ways, that has turned out to be the case. But there is no denying that bluegrass is a male-dominated style of music. For myself, a bright-eyed optimism in the fairness of the market came to be replaced by the realization that certain doors just weren’t going to open for me. A case in point was my now legendary and ill-conceived audition for Bill Monroe and the Blue Grass Boys – needless to say, Mr. Monroe and I had very different notions of exactly what it was I was auditioning for. I was still several years away from hearing that revelatory observation that John Hartford shared with me – namely that bluegrass music wouldn’t exist at all if Bill Monroe hadn’t been out chasing women (well – that’s not exactly how he put it). So, to rationalize the disconnect, I reminded myself of the agrarian culture out of which bluegrass music was born and the social mores of its first-generation creators. Suffice to say; when it came to women’s roles, the founders of bluegrass shared little common ground with Gloria Steinem. But sometime between the late ’80s and mid-’90s, a seismic shift happened in bluegrass and women began to emerge as leaders in the genre. They followed in the path cut by Wilma Lee Cooper, Hazel Dickens, Ginger Boatright, and others. Bandleaders like Rhonda Vincent, Lynn Morris, Claire Lynch, and Alison Krauss stepped into the spotlight and created a watershed moment for bluegrass. Their sweeter lead voices were more palatable to listeners discovering bluegrass than the archetypal high lonesome male lead, and their lyrical and musical aesthetics pushed the envelope for bluegrass sound and opened the music up for broader mainstream appeal. These bluegrass women helped to change the perception of what it meant to “pick like a girl.” They inspired a younger generation of women to become serious bluegrass musicians and, at the same time, created opportunities for other female musicians. For example, when Alison Krauss hired me to play banjo in Union Station, she gave me a springboard from which to launch a career as a nationally recognized banjo player – an opportunity I doubt I would have had otherwise. For this California girl, traveling the Appalachian states playing banjo in a nationally touring band was a fundamental part of my transformation from part-time picker into Banjo Player. It helped me to understand the challenges that women like Sally Ann Forrester, who played with Bill Monroe in the 1940s, faced in the days when it was generally considered inappropriate for a woman to be on the road unless her husband was also in the band. (Sally was married to Monroe’s fiddle player Howdy Forrester.) And it gave me the platform from which to make my contribution to the furtherance of women as banjo players, both in remote regions of the US where people figured that Alison and I must have been sisters because we had the same name (yes, that really happened) and in Pakistan, where I shocked an audience by changing my own broken banjo string mid-song (apparently that’s considered a man’s job in Pakistan). But Rounder Records co-founder (and recent IBMA Hall of Fame inductee) Marion Leighton Levy’s panel discussion about the possible creation of a women’s council within the IBMA shed a light on the darker side of the struggle women still face in bluegrass. While sexism may not be as blatant as it used to be, there is still a strong, disquieting undercurrent. Many of the panel attendees expressed a need for a forum to address the gender specific challenges they face in what is still a male-dominated genre of music. And I was frankly surprised how many of the challenges they described haven’t changed much in the past 40 years. Obstacles as fundamental as the need for a private hotel room on the road were brought up as impediments for female musicians having the same shot at a touring gig as their male counterparts. Yet out of the challenges and frustrations, something else emerged, too. I might describe it as a sense of unity. Where we were once just a few, now we are many. As a collective, our voices have more weight and power than ever to shape the future of bluegrass music for the better. That’s a significant change, and it’s amazing to me to have enough longevity in this music to have been able to experience this sea change firsthand. But, at same time, I’m reminded of the adage that we live by dead men’s books. Major change, especially when it comes to ideas or values rooted in tradition rather than in pop culture, often happens slowly and only as the keepers of the old ways pass the torch on to the next generation. I would be surprised if the road forward were anything but rough and rocky. Still, I’m full of optimism that we’ll get closer to gender parity and that bluegrass music will be the great beneficiary. There’s a talented crop of young women knocking at the door, and a meaningful number of us – women and men – to help them realize their potential.